The mission of the Corpus Christi Food Pantry is to serve those who come to our pantry, with compassion and respect and with a Christ-like servant attitude. We remain open to listening and working diligently to meet the needs of the individuals and families in our community. Monday morning: 10:00 a.m. - 11:30 a.m.
Tuesday evening: 6:00 p.m. - 7:30 p.m.
Thursday morning: 10:00 a.m. - 11:30 a.m. The Corpus Christi Food Pantry is a collaboration between the Cincinnati Freestore/Foodbank and our three parishes (St. John Neumann, St. John the Baptist, and Corpus Christi). The Pantry doors are open to those who live in the boundaries of all three parishes, and the boundaries established by the Freestore/Foodbank. Many volunteers are available to help the guests select food and non-food essentials (including toiletries, cleaning and paper products, as well as school supplies). 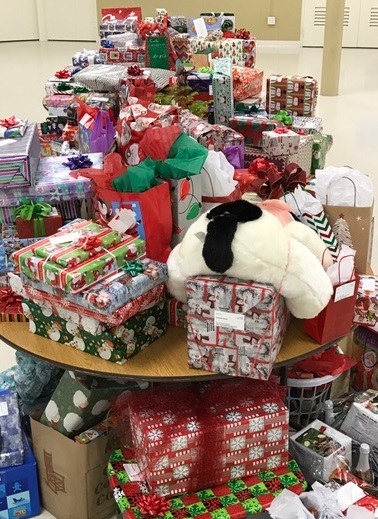 In addition to regular monthly visits, guests are eligible to participate in annual projects that provide food to be prepared for Thanksgiving and Christmas Dinners, along with children's Christmas gifts. The Food Pantry volunteers also provide contact information (such as area St. Vincent de Paul resources), to those that have additional needs. 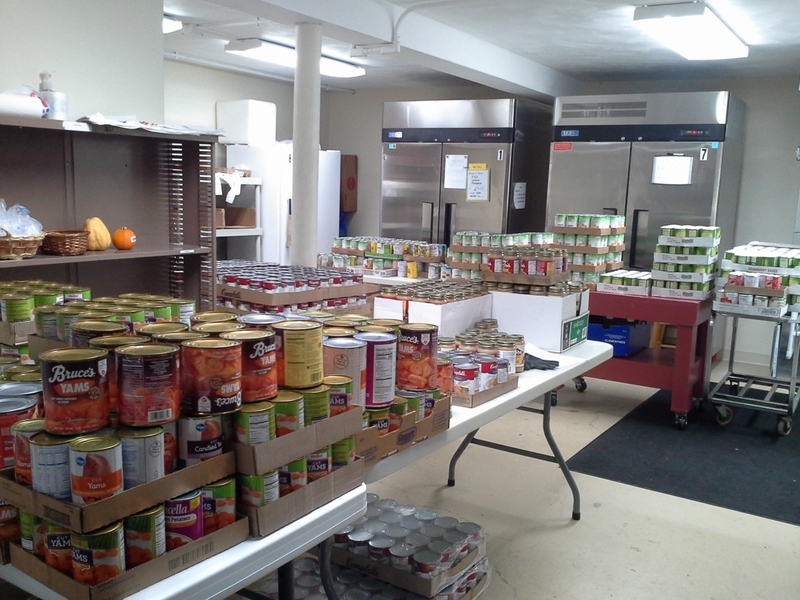 The Food Pantry receives many generous donations to help those in need. Donations often come from Parishioners from all three Parishes, previous pantry recipients, and local merchants. (Among the many merchants are Meijer, Target, Kroger, Bob Evans, and Panera Bread.) The Corpus Christi Food Pantry is very grateful for all the wonderful volunteers and donors. 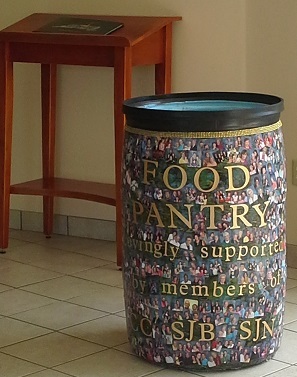 This beautiful Donation Barrel was created with the photos of all of the parishioners in our Pastoral Area. The three Parishes in our Pastoral Area are St. John Neumann, St. John the Baptist, and Corpus Christi. Everyone greatly appreciates the decoration of the Donation Barrel by Parishioners Elda Cofield and Izola White. When you walk through the Gathering Space in Church you can see the barrel usually to the right or in the stairwell leading to Francis Hall. You may place your donations in the barrel on your way to Mass.